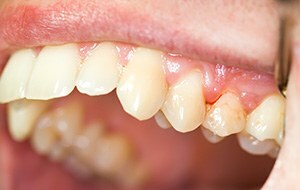 Gingivitis, or gum disease, affects a large percentage of the population, but it's virtually painless in its early stages. As a result, many are unaware that they're struggling with it. The good news is that regular visits with Dr. Louis Olberding can reduce your susceptibility. Let Dr. Olberding’s expertise and attention to detail work for you. He's skilled at finding and addressing complex biological problems related to each patient’s oral health. A keen eye and years of experience allow him to identify and target problem areas so he can design the best treatment plan for your needs. Gum disease starts with the buildup of plaque, a filmy substance consisting of bacteria, food particles, and saliva. In as little as 24 hours, plaque can harden into calculus, which brushing and flossing alone can no longer remove. These deposits produce toxins which attack the gum tissue and start damaging the bone below the gum line. After assessing your situation, your dentist may recommend scaling and root planing to treat or even reverse the onset of gum disease. Gently and precisely, your dentist will use our specialized scraping tools to remove tartar and bacteria above and below the gum line. If necessary, he will also smooth the root surfaces, promoting gum tissue adhesion and discouraging further tartar buildup. Dr. Olberding will identify and treat problem areas, arresting the disease's progression. He will also offer advice to prevent recurrence, promoting a lifetime of healthy teeth and gums. For an even more comfortable and relaxing experience, we offer a selection of sedation techniques, including injection-free anesthetics.